Bear Lake is small, high-end community in Muskegon County Michigan that is known for its breath taking views and gorgeous parks. With its beautiful homes, regular community events, and family atmosphere, this is an ideal place to live and vacation. Bear Lake is a small, luxurious lake in North Muskegon that has access to Muskegon Lake and Lake Michigan through two channels. This smaller, more private lake is calm and great for waterskiing, tubing, and all other water sports. Combined with the direct access to the bigger lakes makes it perfect for any boat enthusiast to enjoy the full Western Michigan waterfront experience. The Northside has many beautiful hilltop homes and several parks with amazing views of the summer time sunsets making it a popular vacation spot looking for rental properties and cottages. North Muskegon is also home to one of the highest performing school districts in the state. 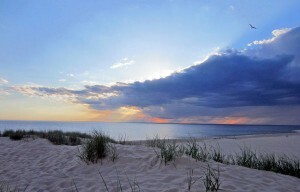 Bear Lake in North Muskegon is known for its spectacular parks. With bluffs overlooking Muskegon Lake, the views of the sunrise and sunset are awe-inspiring. The non-hilltop parks provide quite, secluded sandy beaches and a chance to get away and enjoy the lake. 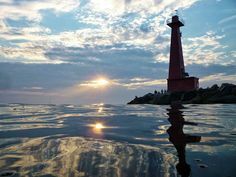 The North Muskegon community prides itself on being inclusive, welcoming, and eventful. Every season is marked with traditional community events and activities. In the summer each year, the city hosts the Northside Family Fun Fest for a weeked of activities. This weekend of events is kicked off with parade starting at city hall followed by the Taste of Northside, an event in Walker and Custer Park with live music and local food vendors. Later that night a fireworks display can be seen over Bear Lake and Muskegon Lake. The weekend is commenced with the annual art fair. The events don’t end at the end of summer though. December boasts the Circle of Trees where Christmas trees are decorated in the park and followed by a lighting ceremony. They also host a Dog Parade where local dog owners can walk their dogs ending at the Community center with hot chocolate, coffee, and cookies. The area is also home to the Bear Lake Tavern. A local resturant and historic landmark that has been serving amazing food, drinks, and atmosphere since 1929. 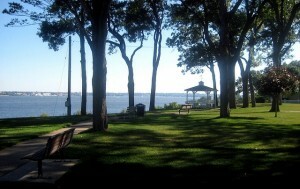 Many Bear Lake waterfront land owners are members of the Muskegon Lake Yacht Club. With its convenient access to Muskegon Lake, you can easily boat over to the clubhouse and enjoy the many activities they host throughout the year. Bear Lake is conveniently located just north of the city of Muskegon. Being close to the highway, means it’s a short drive to the downtown Muskegon waterfront, the Cinema Carousel, or the Lakes Mall. It’s also only a short drive to Grand Rapids. North Muskegon is also just a few miles south of Michigan Adventures, Michigan’s largest amusement park. If you want to see more homes on Bear Lake, please look at our Bear Lake listings page to see what is currently available in the area. Please let us know if you’d like more information about a property or would like to see one yourself by filling out our contact form or giving us a call. We would be happy to schedule a showing with you today.